Perth rail network was closed for 5 days for works conecting the new sunken fremantle line under the old perth rail yards back to through running with the Midland line. With all lines converging at the western portal of the new "City link" tunnel , no trains were running into the city center. This shutdown was ran different to last 3 day shutdown. instead of one Rail replacement bus route linking all terminating train line stations to the city. The more normal individual rail replacement routes applied , 904 Joondalup line, 906 fremantle ect. Anyway here are some shots from the last two days of Rail replacment, which was truly tested in the bad weather endured in the last day or two. First up is Merc Benz 305G UQB670 leaving the Jame St Busway on route to leederville train station on a 904. Roe st & Fitzgearld st is were the 904 & 906 routes came together ,even thou departing from two different stand locations. 727 is seen entering Roe st with the new Police complex in the background. The small headlight and clear OC indicators just don't look right here on TP1112. MBC BM10 Volvo on a 906 on Roe St.
Adams " COTT Cat" Dennis Dart TC 6899 on here way to Freo. Joes Bus charter Merc Benz Livery is not often seen north side by me , let alone being able to capture it when it is,so i was pleased to get this one. Another TP renault running a 904. Under very gloomy skys renault PR 180 UQB720 turns into roes st with the rail line western portal visiable in the background. One of the bues (a Manual) we rode on later that day. one of BusWest Custom Coaches Volvo B10M on Roe st.
More to come ,So Enjoy . The whole World is going to "HELL" And I'm driving the Bus! Location: Sitting behind a wheel thingy where all the lights & switches are. To good to be on RR is Adams coachlines C62 Bonluck TC6956. UQB670 is under the Fwy on Roe st while we keep dry. One of the few private artics that got about on RR. Just laying over on Roe St is Buswest HINO RG230 TC3621. A rare sight more buses than cars on Wellington st.
Afew that were laying over on Wellington st today. Westwide ex action bus Renault Pr100 ansair. And today Evan had C37 seen here to on Wellington st at WSBS.And UQB682 was the spare bus down at WSBS and was put on a 904 shortly after this shot was taken. Cool shots, I was hoping someone would capture the moments. That Westwide Nissan JP251 would've been a delight to ride in Nice selection of all sorts of buses. The only time that the variety ever shakes up is on these massive rail replacement and on emergency rail replacement. I missed that Bonluck by a whisker at cottesloe station on Saturday afternoon. Ain't no fuss when your on a bus! Mostly O305s and some Volvos now. Never mind that Phonj, standing on King William St in Adelaide, you're not sure if it's Adelaide, Melbourne, Sydney or Brisbane with all the odd buses going around there at the moment! 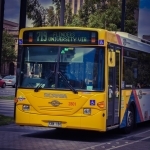 busrider wrote: Never mind that Phonj, standing on King William St in Adelaide, you're not sure if it's Adelaide, Melbourne, Sydney or Brisbane with all the odd buses going around there at the moment! I can relate I was just watching a video of ex Southlink 2440 ex Torrens 1893 that's at Horizons West now. And that's what makes it interesting! Make that a touch of Canberra,Adelaide,Melbourne,Sydney and Brisbane including the Adams and Westwide ex Action Renault`s in High Floor pictures.You don`t need travel East. Thanks for sharing stuff I haven't seen since 3 years back. Is it just me, or is there a great big grey splotch on UQB720's front? Bus Suggestions wrote: Thanks for sharing stuff I haven't seen since 3 years back. Is it just me, or is there a great big grey splotch on UQB720's front? Yep, you're not the only one. It actually looks like that it has pealed off and is hanging upwards, just at the lower bit of the windscreen. Maybe a strong bit of wind caused that?